NAIROBI, Oct 12 2017 (IPS) - A growing number of African countries are increasingly becoming food insecure as delayed and insufficient rainfall, as well as crop damaging pests such as the ongoing outbreak of the fall armyworm, cause the most severe maize crisis in the last decade. Experts have warned that as weather patterns become even more erratic and important crops such as maize are unable to resist the fall armyworm infestation, there will not be enough food on the table. Over 17 million people in Djibouti, Eritrea, Ethiopia, Kenya, Somalia, South Sudan, Sudan and Uganda have reached emergency food insecurity levels, according to the UN agency. “Maize is an important food crop in many African countries and the inability of local varieties to withstand the growing threats from the fall armyworm which can destroy an entire crop in a matter of weeks raises significant concerns,” Hilda Mukui, an agriculturalist and conservationist in Kenya, told IPS. “Due to its migratory nature, the pest can move across borders as is the case in Kenya where the fall armyworm migrated from Uganda and has so far been spotted in Kenya’s nine counties in Western, Rift Valley and parts of the Coastal agricultural areas,” she said. FAO continues to issue warnings over the fall armyworm, expressing concerns that most countries are ill-prepared to handle the threat. The UN agency has confirmed that the pest has destroyed at least 17,000 hectares of maize fields in Malawi, Zambia, Namibia and Zimbabwe. Across Africa, an estimated 330,000 hectares have been destroyed. “To understand the magnitude of this destruction, the average maize yield for small scale farmers in many African countries is between 1.2 and 1.5 tons per hectare,” Dr George Keya, the national coordinator of the of the Arid and Semi-arid lands Agricultural Productivity Research Project, told IPS. FAO statistics show that Africa’s largest producers of maize, including Nigeria, Kenya, Tanzania, Uganda and South Africa, are all grappling with the fall armyworm outbreak. Uganda’s Ministry of Agriculture notes that the maize stalk borer or the African armyworm – which is different from the fall armyworm – cost farmers at least 25 million dollars annually in missed produce and is concerned that additional threats from the vicious Fall Armyworms will cripple maize production. FAO and the government of Nigeria in September 2017 signed a Technical Cooperation Project (TCP) agreement as part of a concerted joint effort to manage the spread of the fall armyworm across the country. According to experts, sectors such as the poultry industry that relies heavily on maize to produce poultry feed have also been affected. Within this context, scientists are now pushing African governments to embrace biotechnology to address the many threats that are currently facing the agricultural sector and leading to the alarming food insecurity. According to the African Agricultural Technology Foundation, a genetically modified variety of maize has shown significant resistance to the fall armyworm. Based on results from the Bt (Bacillus thuringiensis) maize trials in Uganda, scientists are convinced that there is an immediate and sufficient solution to the fall armyworm. Although chemical sprays can control the pest, scientists are adamant that the Bt maize is the most effective solution to the armyworm menace. Experts say that the Bt maize has been genetically modified to produce Bt protein, an insecticide that kills certain pests. Consequently, a growing list of African countries have approved field testing of genetically modified crops as a way to achieve food security using scientific innovations. The Water Efficient Maize for Africa (WEMA) which is a public-private crop breeding initiative to assist farmers in managing the risk of drought and stem borers across Africa, is currently undertaking Bt maize trials in Kenya, Uganda, Mozambique and recently concluded trials in South Africa to find a solution to the fall armyworm invasion. The African Agricultural Technology Foundation confirms that on a scale of one to nine, based on the Bt maize trials in Uganda, the damage from the armyworm was three for the Bt genetically modified variety and six on the local checks or the popularly grown varieties. Similarly, Bt maize trials in Mozambique have shown that on a scale of one to nine, the damage was on 1.5 on Bt maize and seven on popularly grown varieties. “These results are very promising and it is important that African countries review their biosafety rules and regulations so that science can rescue farmers from the many threats facing the agricultural sector,” Mukui explains. In Africa, there are strict restrictions that bar scientists from exploring biotechnology solutions to boost crop yields. According to Mukui, only four countries – South Africa, Sudan, Burkina Faso and Egypt – have commercialized genetically modified crops, while 19 countries have established biosafety regulatory systems, four countries are developing regulatory systems, 21 countries are a work in progress, and 10 have no National Biosafety Frameworks. Nigeria, Uganda, Malawi and more recently Kenya are among the countries that have approved GM crop trials after the Kenya Biosafety Authority granted approval for limited release of insect resistant Bt maize for trials. 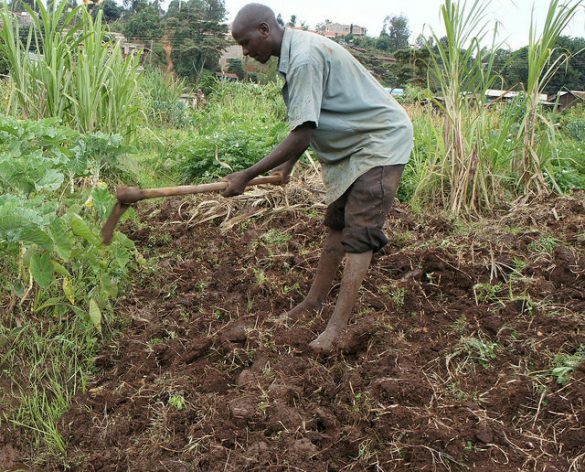 As Africa’s small-scale farmers face uncertain times as extreme climate conditions, crop failure, an influx of pests and diseases threaten to cripple the agricultural sector, experts say that there is sufficient capacity, technology and science to build resilience and cushion farmers against such threats. “But even as we push for biotechnology, there is a need for regulations that guarantee the protection and safety of people and the environment,” Mukui cautions. When you use BT maize the army worms develop immunity over time, and the4n the next round of biotechnology will be more poisonous for people and other living things. maybe the4y should release insect eating birds instead. Systemic BT poison is definitely not the answer. I am surprised that you are publishing this misinformation. What’s next? Ads for Roundup?